Neath Port Talbot College website redesign and build was a big task but we loved it! The design of the website was pretty straightforward, using their corporate colours and logo. We used the modern block/ tile design style throughout the site allowing all information to be clearly displayed. We also designed call to action buttons to be solid block colours so that they would stand out from any background text. This helps the site to be much more user friendly. The more difficult element of building the site came when populating the site with content. This was tricky because the website has a large number of different sections, including colleges and courses, meaning we needed to make sure all content was populated in the correct place. Working closely with the client, we managed to get all the content in the right place, including correct ordering of the drop down menus and any sub-menus. Together we created a perfect site ready to go live. 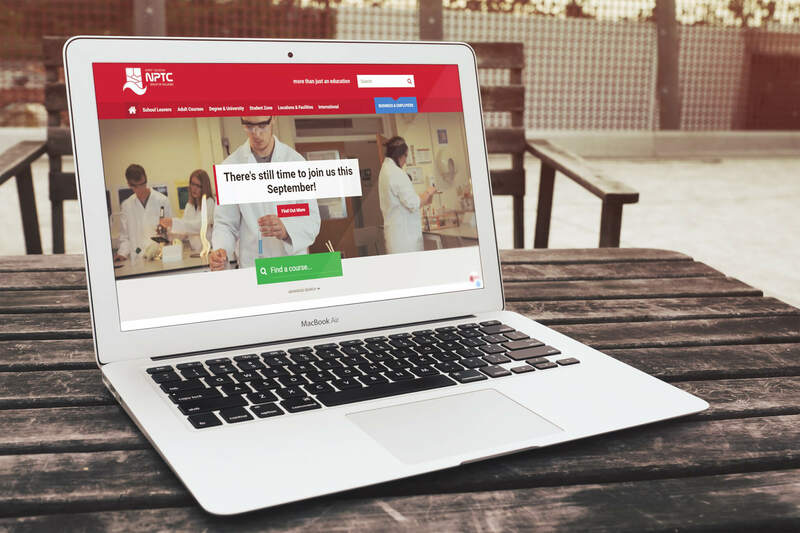 Communicating back and fore with NPTC throughout the whole project meant that we were able to create a fully functioning modern website, providing the students of South Wales with all the information they need! We look forward with working closely with NTPC in the future, helping them grow and expand the website as their colleges and courses expand! Working closely with the client, we managed to get all the content in the right place, including correct ordering of the drop down menus and any sub-menus.